Get on over to Dixie Delights to check out my guest feature, August|Morgan linen napkins. I have fallen for these hard. They are the cutest napkins ever. Do you ever wonder, I wish I would have thought of that ??? I sure wish I would have because these are right up my alley. This weekend is a busy one as my Science Olympiad team is competing in State Competition this weekend. It is also French Quarter Festival. The festival season has begun. Shell we have another, y'all! Yes, cute! Good luck to your Olympiad team. Then party on in the Quarter! Happy Weekend! Good luck to the team. I love the lobstah's on the napkins. I went crazy for them on napkins not to long ago. Good luck with the team and the competitions! Yay for festival season! 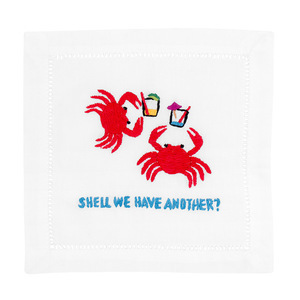 I love embroidered cocktail napkins!